There’s good and bad in almost everything. Lately you’ve been dwelling on a bad part of the internet with good cause, but today I stumbled across one of those hidden treasures on the web and I thought I’d share it with you. 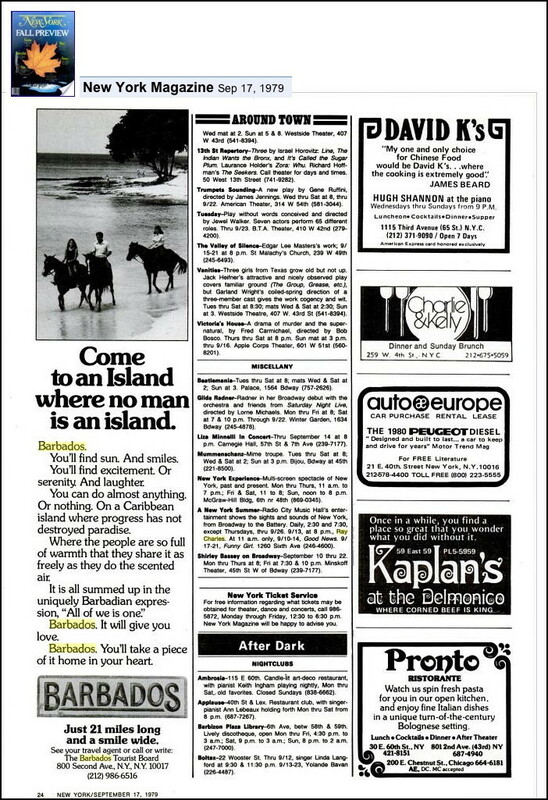 I was searching for “Ray Charles” and “Barbados”, looking for some photos of the master playing at the Barbados Jazz Festival when I came across a page of the New York Magazine from September 17, 1979. It was Ray Charles and Barbados together, but not in the way I was looking for. Can we still fulfill the promises of that advertisement? I know that we once did, but I’m less sure about where we are inviting our tourists today. Some of the smiles have faded I think. Not all, but enough to make a difference in the mood of the place. Then my eyes went to “Ray Charles” on the same page. In 1979 he was playing Radio City Music Hall and I suppose you could have seen him for twenty dollars. Shirley Bassy, Gilda Radner, Beatlemania and Liza Minnelli were available too. New York: what a city! That was my smile for the day and I hope you enjoyed it as I did. You have to love the internet for the special little gifts it brings into your life if you let it. Can some “internet addictions” be positive? I think so. Like everything else in our lives it is up to us to choose what we allow into our homes and on our computer screens. Here is a present for you for July 4th. Enjoy! In a word what has gone wrong with this island since 1979: “CARS”. Bajans are subservient to the automobile. We spend our tax dollars building more roads, 4 lane roads. When will it stop? When will we have enough personal autos on this tiny island? Our so-called ‘leaders’ let us down for 25 years on this issue. We should have a rail line people mover throughout the island. NOT ONE MORE ROAD SHOULD BE BUILT. We need all the new roads we can get! ALL our roads need to be expanded instead! ‘Progress’ or whatever you want to call it ….goes on! We cannot turn it back -not with 300,000 people on this tiny rock. Actually, I think Barbados should do like Bermuda and limit each household to one car, if you MUST have another vehicle then you pay extra accordingly. about the 1 car per household thing. When she and I got together, we had 2 cars between us. Spiralling economics quickly made us decide if 2 cars was truly necessary. Take a look at Europe, densly populated with too many cars. Then look again and notice the bicycle lanes, countries like the Netherlands, Denmark, Sweden are changing their ways in being more environment friendly. Less obesity, less diabetes, less pollution. Really? what is this “progress” you talk about? Is it about more trash on the road? Is it about more building and walling off the coast so chilldren can’t have a sea bath? What is this progress? Two hours to drive out of B’town only 20 minutes walk. Is that progress? Dem gov’mnt let it happen with no plan and no idea that they can steer the ship in the storm. you must steer the ship or the waves will take you where they will.